a rare 1934 old time radio show about two dancers competing in the world of vaudeville. "You know I love you doncha'?" "Yeah I guess so, but I don't think you've above practicing on somebody else!" Hoofers is a rare 1934 old time radio serial about two dancers competing in the world of vaudeville. A "hoofer" was a dancer in vaudevillian stage who primary danced with their legs and feet, similar to tap-dancing. In this show we go behind the curtain to see the interpersonal relationship between two star dancers who also happen to be a couple. "Do you know what I like to do?" "Are you going to miss me darling?" Tie those tap shoes on tight, the world of a Hoofer in vaudeville is a wild dance. 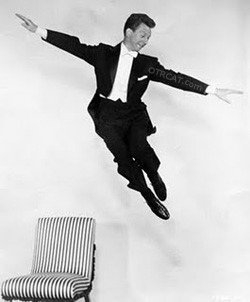 See also: Cecil and Sally and for more "hoofing" recordings, see Fred Astaire Collection. For more early 1930's comedy vaudeville-inspired comedy, see also: Komdie Kapers. Be the first to comment on "Hoofers"
Hoofers 34 episode 04 [bad opening].